Malala Yousafzai announced the first grant from the charity fund set up in her name, with support from Angelina Jolie. It's being reported by NBC that Malala Yousafzai – the young girl shot in the face by the Taliban – has been formally nominated for a Nobel Peace Prize. Malala, who was treated for her injuries at Birmingham's Queen Elizabeth Hospital, was shot on her way home from school for her efforts in promoting girls' education in Pakistan. Her name was put forward by three members of the Norwegian parliament on Friday. If awarded, Malala will be the youngest recipient and one of only 15 females to be awarded the prize. 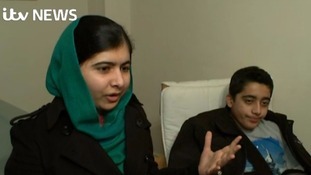 President of Pakistan Asif Ali Zadari is due to visit Malala Yousafzai in hospital in Birmingham. 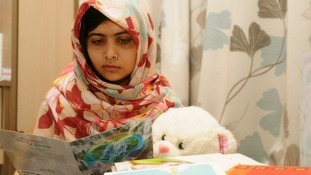 Malala has been in the Queen Elizabeth Hospital since 15th October after she was shot by the Taliban earlier that month. The 14-year-old made a name for herself by speaking out against the Taliban and advocating education for women. She wrote a blog for the BBC's Urdu Service about her experience living in the Swat Valley. She is was shot in the head and neck after a Taliban militant boarded the school bus she was travelling on in the capital of the Swat Valley region Mingora. Doctors say her injuries are not life-threatening. A vigil for the Pakistani school girl Malala Yousafzai is being held outside Birmingham Council. More than 600 people from around the world have posted messages of support for the 14-year-old on support page set up by Birmingham Hospital.